The aorta, the largest blood vessel in the body, emerges from the heart in an upward direction before bending backwards and downwards to supply the lower parts of the body. This curvature, known as the aortic arch, also gives off branches that supply the brain and arms. 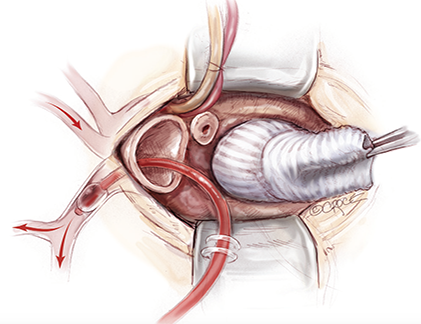 When the wall of the aortic arch dilates causing an aneurysm, surgical intervention may be required, as progressive dilatation may lead to rupture. Risk factors for aortic aneurysms include hardening of arteries (atherosclerosis), high blood pressure, some genetic conditions (such as Marfan’s Syndrome or Bicuspid aortic valve), tissue pathologies which weaken the aortic wall, or trauma. Here, we demonstrates a case of a 52 year-old man who was found to have a leaking bicuspid aortic valve and a 5.2 cm aneurysm, extending from the aortic root to the proximal arch. He underwent a minimally invasive aortic root replacement (Mini-Bentall Procedure) and hemiarch replacement via a 7 cm access incision. He was extubated in the operating room immediately after the surgery. He had an enhanced postoperative recovery and was discharged home on postoperative day 6. (Video 1). A typical patient with a bicuspid aortic valve and thoracic aortic aneurysm who undergoes an elective minimally invasive aortic procedure would expect no intraoperative blood transfusion, early extubation, less than a week of hospital stay and better cosmesis.